Clintonville Finance and Council Met Tuesday Evening. 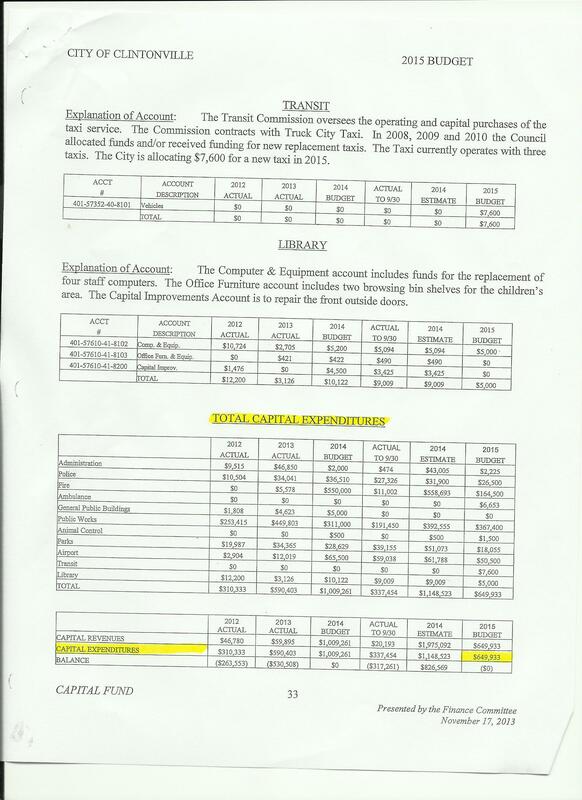 The only action that took place was both Finance and Council approved the bills in the amount of $201,018.16. Listed below are the final bills from 2014. No budget action was taken. 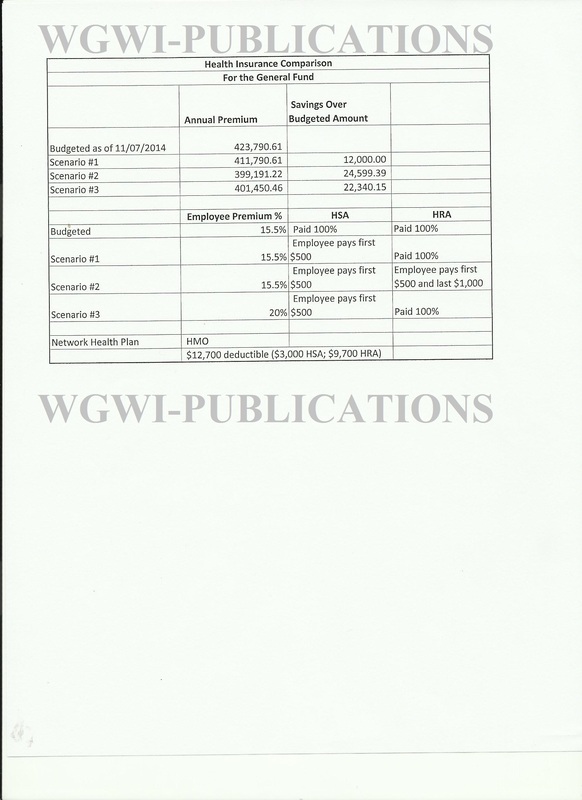 The council was informed of an update that the previous amount of the Undesignated Fund balance was $1,700,000. 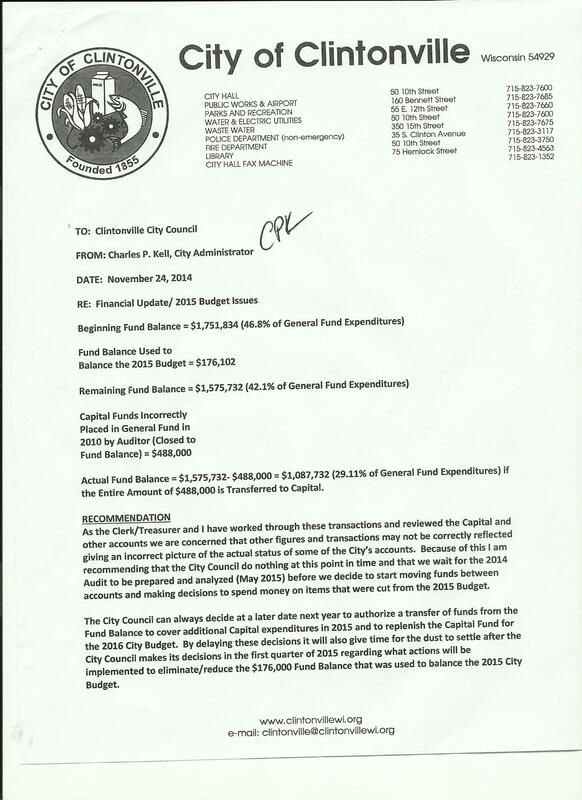 Due to an error by the city’s auditors the Undesignated Fund balance is $488,000 less than it was previously thought to be. 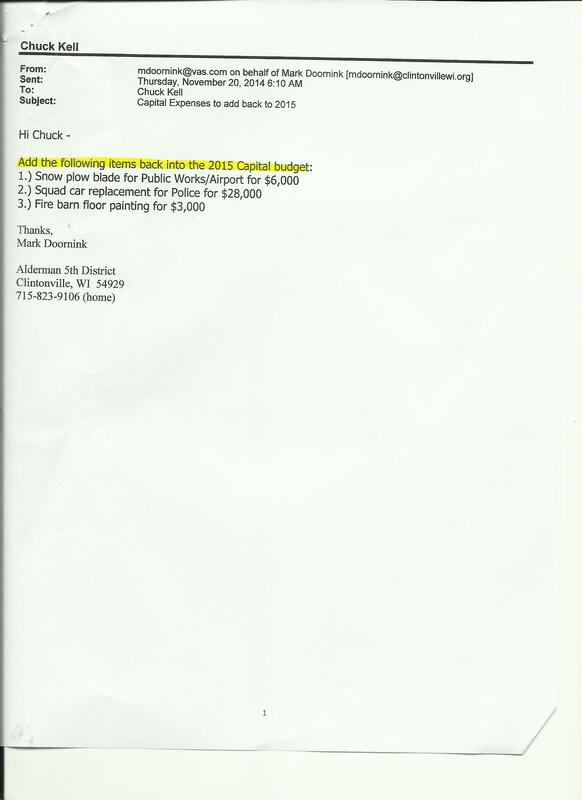 Handout #1: Letter from Finance Committee Chairman Mark Doornink stating his recommendations to council. NO ACTION TAKEN. 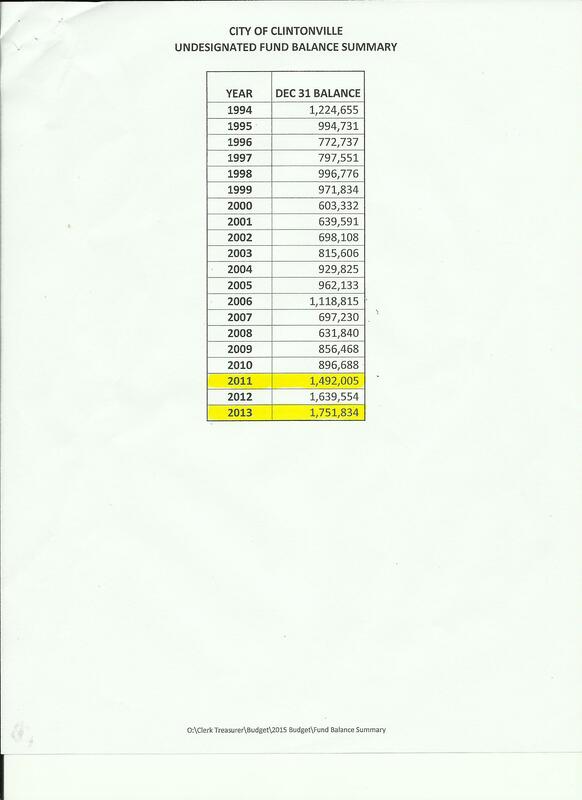 Handout #2: A rundown of the Fund Balance and explanation of the less Fund Balance money. An Appointment was made for Veterans Memorial Committee Rhonda Havlik was voted in with no objections. Madison – Governor Scott Walker’s office announced the 2014 holiday tour schedule for the Executive Residence. These tours allow visitors to experience first-hand the beautiful decorations and scenery, including views of the main rooms on the first floor, which feature Christmas trees with unique decorations that have been crafted by Wisconsinites throughout the state. “The Executive Residence belongs to the people of Wisconsin, and we are happy to open the doors to those who want to see just how beautiful it is during the holiday season.” Governor Walker said. This year, Governor Scott Walker and First Lady Tonette Walker have partnered with Second Harvest Foodbank and the Wisconsin Department of Tourism’s Big Bundle Up Campaign in order to promote selflessness and generosity this holiday season. Non-perishable food items and warm weather items, including new or gently used mittens, hats, scarves, coats, sweaters, jackets, and snow pants are happily accepted at the residence before and after the tours and will be donated to those in need. · Wednesday, December 3: Noon – 2:00 p.m.
· Thursday, December 4: Noon – 2:00 p.m.
· Wednesday, December 10: Noon – 2:00 p.m.
· Thursday, December 11: Noon – 2:00 p.m. The Executive Residence is located at 99 Cambridge Road on Madison’s northeast side in the Village of Maple Bluff. Driving directions can be found here. Tours are free of charge, and cameras are allowed. Parties of 20 or more are asked to make a reservation by calling (608) 246-5501. Parking is available directly outside the residence gates. The Executive Residence is handicapped accessible, and handicapped parking is available upon request at the time of arrival. Finance Committee chairman Mark Doornink said citizens don’t have to wait until the public budget hearing Nov. 18 to voice their opinions, they can come to tonight’s council meeting to let the council know what they think of the budget. The meeting starts at 6 p.m. tonight, Tuesday, Nov. 11. Clintonville Finance committee met Tuesday evening 10-28-14 to continue working toward a solution to balance the budget. (See Handouts Below) All committee members were present. Council members were also on hand and the only one missing was newly appointed Alderperson District 3 Amy Steenbock. The meeting lasted 3 hours many residents left during the meeting due to the length. Brad Rokus and James Beggs spoke during the citizens forum. (See Video Recording Below). 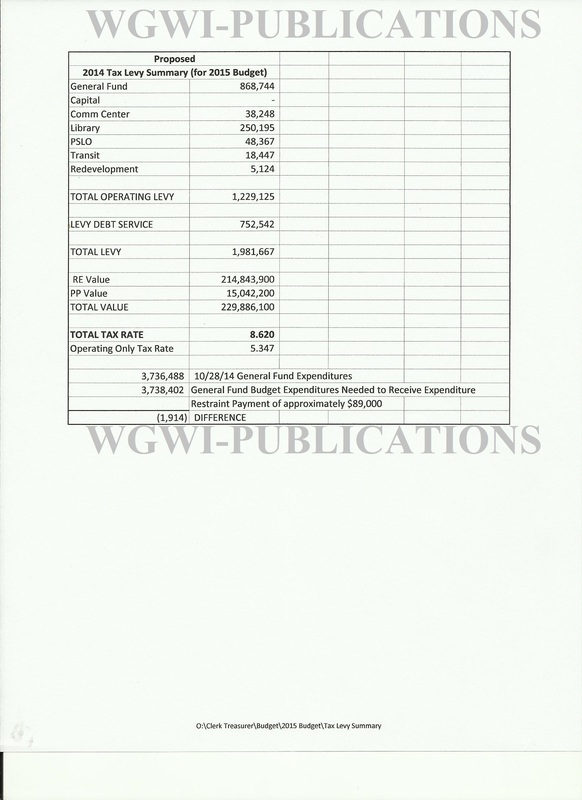 The Finance Committee was able to come from $425,063.00 down to $234,914.00. 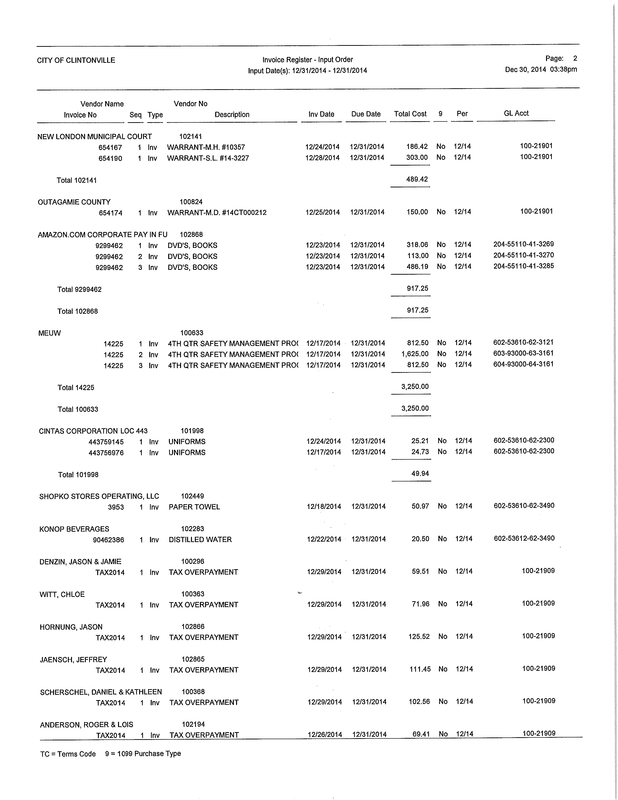 The Finance Committee will meet again Tuesday October 28th 2014 at 4:00pm to hopefully come up with the negative $234,914.00. 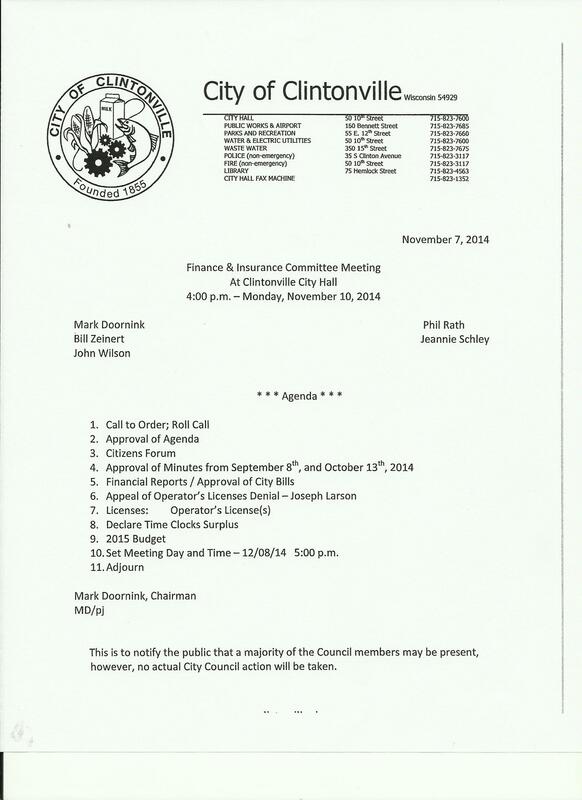 Here is the video from the Tuesday October 21st 2014 Finance Committee meeting.. It is with regret that I inform the residents of Clintonville that I am taking a Medical Leave of Absence from my position as Mayor. As many of you know, since the last election on April 1, 2014, there has been a great deal of turmoil in City government. I am honored to be elected by the voters and I take the position very seriously. However, since April 1 I have had numerous threats made to me and my position, six members of the Council are regularly attacking the work I do, we have had a Council member resign, the City Administrator resign and a new City Attorney who is related to two Council members. The upcoming budget approval will be worse than any other in terms of cuts that must be made. It is critical at this time that the stakeholders (citizens, voters, business owners and neighbors who conduct business in the City) of this community be heard as to what they want the future of our City to look like. The future of Clintonville impacts all the stakeholders who care about the community. I personally do not feel that the majority of this Council is taking us down a positive road. However, I am elected by the citizens and it is difficult to determine from my vantage point what everyone truly wants. As stakeholders if you are content and approve of the actions the Council majority has made in the past four months then perhaps the majority of the Council is acting as you wish them to. If you do not agree with the path we are on it is critical that you speak up and be heard publically. I cannot, along with a small group of Council members, carry the weight of 4,535 people on my shoulders. I intend to first get my mental health back to a good place and then it is my hope that starting immediately you as stakeholders will speak loud and clear as to what you want from your elected officials. I will return to my position when my health is better but no later than November 26, 2014. In my absence it is the responsibility of Council President Jeannie Schley to act in the absence of the Mayor – her phone number is 715-823-6863. Please note Jeannie Schley does NOT have an e-mail address. I want to state again that I take my position as Mayor very seriously and it is with great regret that I am taking this Leave. Next regular council meeting is, Tuesday, October 14, 2014 – 6 PM. 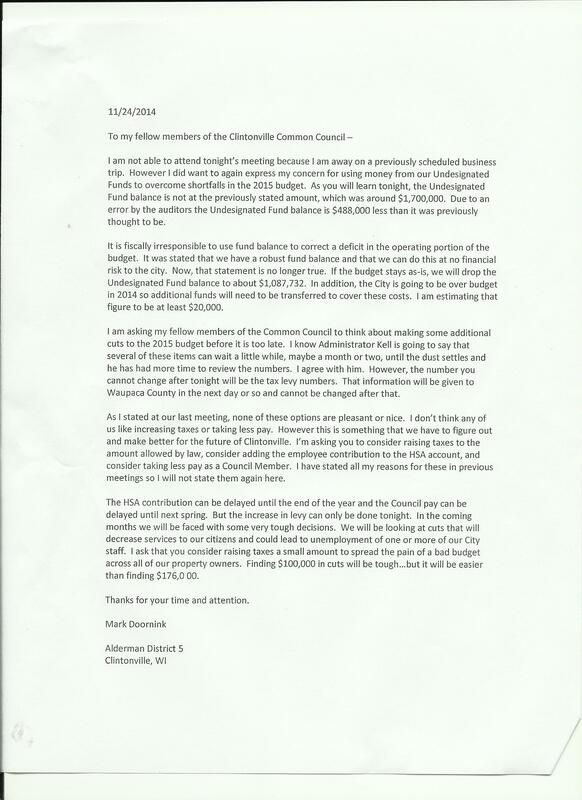 I am making this request that any agenda items added by the council members, attorney, or anyone else regarding the Mayor is to be held in open session so that the taxpayers of Clintonville know what is being said about me!